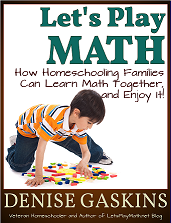 Let’s Play Math by veteran homeschooler (and maths blogger) Denise Gaskins is the maths book I’ve been looking for ever since we began homeschooling. 1. It’s incredibly readable. I found myself going to bed an hour early every night to enjoy it, and had read it cover-to-cover within a few days. 2. It’s chock full of suggested resources. These alone are more than worth the cover price. The Kindle version allows you to click straight through to the linked websites – brilliant. 3. It’s comprehensive. Combined with all the linked resources, this book is going to transform how I teach my kids maths. No more dabbling in “real maths” but then running back to the workbooks when anxiety strikes (me) – with this approach I can teach my kids to think like mathematicians without worrying about leaving gaps. Why do we teach our children maths? So they can become mathematically literate adults, able to calculate their taxes and mortgages? To pass exams which will allow them to get into college or the job market? Both good reasons. The problem is, many of us are so anxious about failing to do these things that we deprive our children of perhaps the most important reason to learn maths of all: because maths is beautiful, and fun. Humans are hard-wired to enjoy puzzles. When we learn something new, we receive a hit of the feel-good hormone dopamine. When the new information comes as a surprise, we get a double dopamine hit. That’s why “Aha!” moments, like when we get the answer to lateral thinking puzzles, feel so good. Let’s Play Math is about cultivating the “Aha!” factor in our children. Living Maths – Where to Start? Anyone who surfs the educational ‘net knows that there are plenty of creative maths ideas out there. But this abundance of resources can be overwhelming. As Denise says, “It seems easier to shove a textbook across the table and say, ‘Work two pages'”, leaving someone else to make all the decisions. Let’s Play Math cuts through the overwhelm. Let’s Play Math has a section on buying manipulatives (ask questions like “is it strew-able?”, “is it worth the storage space?”) plus a section on homespun manipulatives, together with lots of ideas for using them. “I am sure that no subject loses more than mathematics by any attempt to dissociate it from its history”. 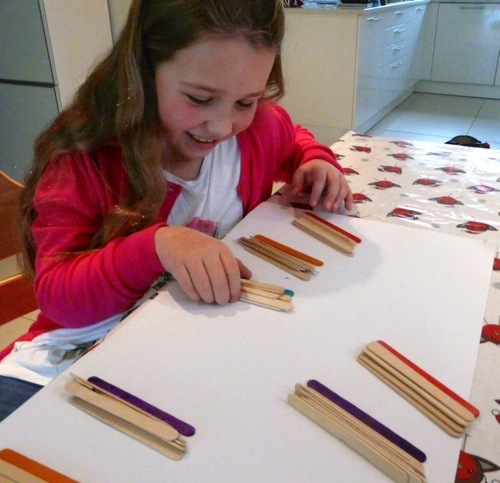 What is it about maths that has parents who use living books throughout our homeschools reaching for the textbooks? History is full of men and women so fascinated by this subject that some of them overcame extremely oppressive circumstances to find a way to pursue their passions. When we share their stories we give our children a taste of the excitement of maths. Let’s Play Math suggests devoting one maths lesson a week to maths history, and offers plenty of ideas on how to choose good living maths books. There’s even a whole chapter entitled “4,000 Years of Stumpers” – puzzles that have challenged mathematicians throughout the ages. Denise suggests that we might measure homeschool maths success by whether or not our children fear story problems, and the book is full of tips and resources for using story problems effectively. One of my favourite is to take turns, adults included – getting the chance to challenge Mum always goes down well in this house! 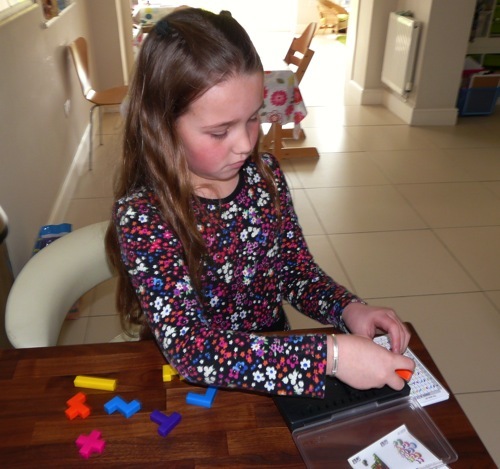 Taking turns makes maths into a game. My two are only 8 and 9 at the moment but after reading the chapter on the “Transition to ‘Higher’ Math” I believe we can use this approach throughout all our homeschool years, including those when my children might be taking exams. I intend to use Let’s Play Math as our maths “spine” but, like Project-Based Homeschooling, I think you can do as much or as little of it as fits with your individual homeschool style. Read the book, feel inspired, and do whichever activities sound like fun to you. My favourite section of the book is “One Week of Real Mathematics”, which contains examples of what one week’s worth of math playtime might look like. I love having this starting point to show me what a balanced “maths diet” might look like. My kids have a low tolerance for boredom and are very outspoken when something isn’t working for them, one consequence of which is that we threw out maths curriculum some time ago. Since then we’ve read maths biographies, played with platonic solids, and enjoyed solving story problems – with the odd workbook thrown in here and there when I get the “Argh! I’m leaving gaps!” anxiety. I feel like I’ve been ambling in the woods – enjoying the journey but a bit anxious about where we’re going to end up and whether we’re going to reach our “destination” “on time” (whatever that means!). I knew the well-travelled road (maths curricula) wasn’t for us, but I lacked confidence in my ability to guide my children through uncharted territory. Let’s Play Math is the map and the guidebook I’ve been looking for. With it in my hand I can’t wait to take my children by the hand and head off to explore the wonderful world of maths. * I was not paid for this review. I bought my own copy of the book and I’m writing to share this great resource with other parents. That book sound just like my sort of thing. We enjoy cultivating the joy of math. You’re another who inspires me with maths, Phyllis. I love reading your restaurant maths posts, and I recently got a copy of “Family Math” after reading your blog – thanks! Wow, Lula, thank you for the wonderful review! I’m always excited to find a fellow homeschooler who shares the vision of teaching math as mental play. 🙂 May your children thrive on the adventure of learning! Thank YOU, Denise, for sharing your vision in a way that makes this kind of maths feel do-able! My children have already been asking “Really? THIS is maths?” this week as we play with pattern blocks and count the petals on spring flowers. Oh and my 8yr old son is addicted to KenKen! I don’t have a tablet or e-reader and I still prefer to hold books. Is ‘Let’s Play Math’ available in any format other than Kindle edition? I prefer to hold “real” books, too, Melissa. Eventually, Let’s Play Math will come out in paperback, but that requires a lot more work than an ebook (interior layout, new graphics, index, etc. ), and I don’t know how long that all will take. Sorry! Meanwhile, if you like, you can read an ebook on your desktop computer either by getting a pdf (at Smashwords) or using a free program like Adobe Digital Editions (for epub books) or the Kindle app (for Amazon books). I keep dipping my toes in and out of living maths. I don’t think I would be able to fully do without a text book, but it is a really exciting way to learn maths!! This is a great and thorough review! Thanks Claire 🙂 Yeah it’s a bit nerve-wracking doing away with textbooks. I still take sneak secret peeks, of course – I’m ok as long as I don’t put them in front of my children! This looks like something my girls would enjoy. We use Life of Fred for my youngest daughter (10) because she simply turned off at any “traditional” approach to math concepts. Thanks for sharing! My 8 year old still gets me to do LoF with him every day – I’m glad, I want to know what happens in the story! Just showed my 2 your girls’ Gummy Bear video – we were all admiring their gymnastics! What a great review, Lucinda! I haven’t seen this book before so thank you for sharing such a great find. Maths taught in a lively way is the way to go! Thanks, Hwee. The book is a real bargain – it’s packed with inspiration. Thank you so much for sharing this resource! I just ordered the kindle version and am excited to use it! My 5 year old despises anything that looks like a worksheet, thus Math U See was not working well for him at all. I think this might be the perfect solution for him! Hi Cari – I’m so pleased you found this post useful – I hope you find the book as inspiring and useful as I have. My children are the same as your 5 year old about worksheets. They find them fun for about a day but then boredom and resistance sets in. Our new living maths routine is so varied, it keeps us all interested!